This PDF 1.7 document has been generated by Adobe InDesign CC 2014 (Macintosh) / Adobe PDF Library 11.0, and has been sent on pdf-archive.com on 23/03/2016 at 20:14, from IP address 157.130.x.x. The current document download page has been viewed 212 times. File size: 897 KB (4 pages). the mark; however, failure can often be attributed to deficiencies in the planning process itself. holding unstructured meetings leave a lot of gaps. deliverables, and do so efficiently to prevent overload. project run off the rails. key processes, resources, and timelines. for information visualization and management. complex data more accessible, understandable, and usable. in a way that is easier to understand and more actionable. You can think of mind maps as virtual whiteboards. Institute estimates that approximately 70% of projects fail each year due to a lack of proper requirements management. to be accomplished, and priorities for resource allocation. manager having to transcribe notes. Mind map “topics” are organized in hierarchical layers to display levels of detail. when priorities aren’t clear and expectations aren’t met. planning process transparency needed to ensure alignment. projects started on a firm footing. impact on the highest level topic. same file management system, without strict naming conventions for folders and files, it’s hard to maintain order. available for review within the larger project map. apps within the overall project map. equally important to get the commitment of the people who’ll be doing the work. tools don’t include features that will help you pull together the plan. out what those tasks are in the first place. even include a Gantt chart view. clarity to dependencies and commitments. changes in assumptions and dependencies to be instantly displayed. including clear annotation of critical dependencies. SharePoint and other software for tracking progress. 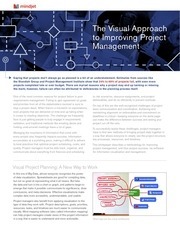 ideal for keeping senior management fully informed of project progress. especially with respect to communication and collaboration. power of visualization can help you achieve success. an extensive library of project-oriented map templates. Cost Benefit, Balanced Scorecard, and more. within the context of the map. and/or export map topics to Microsoft PowerPoint. Outlook, Project, Word, and Excel. or contact a Mindjet sales representative or reseller. including 83% of Fortune 100 companies. tasks in MindManager maps) to manage project execution. This file has been shared by a user of PDF Archive. Document ID: 00352745.